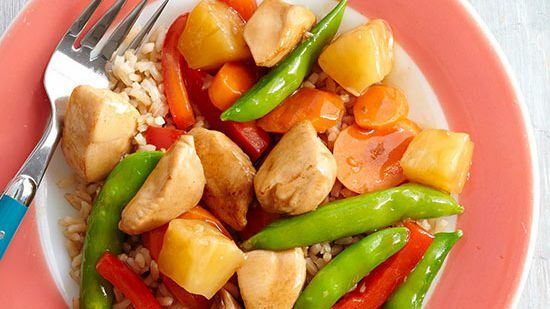 This fast chicken and vegetable stir-fry dinner beats takeout any day! For sauce, in a small bowl stir together water, soy sauce, hoisin sauce, cornstarch, ginger, and sesame oil. Set aside. Cut flowerets from broccoli stems and separate flowerets into small pieces. Cut broccoli stems crosswise into 1/4-inch slices. Cut pepper into short, thin strips. 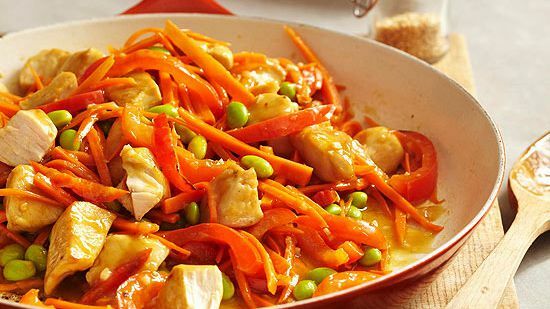 In a wok or large skillet heat 1 tablespoon of the cooking oil over medium-high heat. Cook and stir broccoli stems in hot oil for 1 minute. 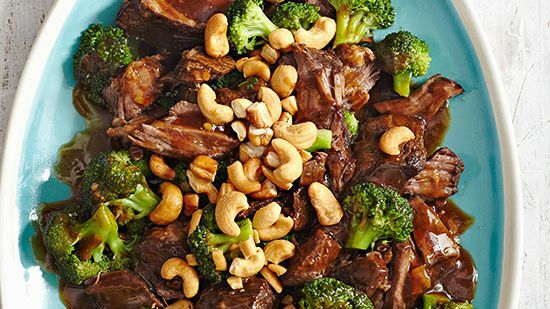 Add broccoli flowerets and sweet pepper; cook and stir for 3 to 4 minutes or until crisp-tender. Remove from wok; set aside. Add remaining oil to wok or skillet. Add chicken; cook and stir for 2 to 3 minutes or until no longer pink. Push chicken from center of wok. Stir sauce; pour into center of wok. Cook and stir until thickened and bubbly. 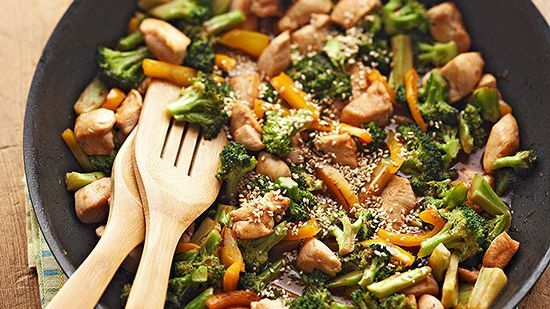 Return cooked vegetables to wok. Stir together to coat. Cook and stir 1 minute more or until heated through. 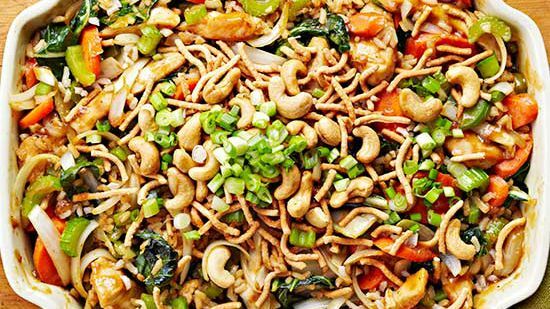 Serve over chow mein noodles or rice. 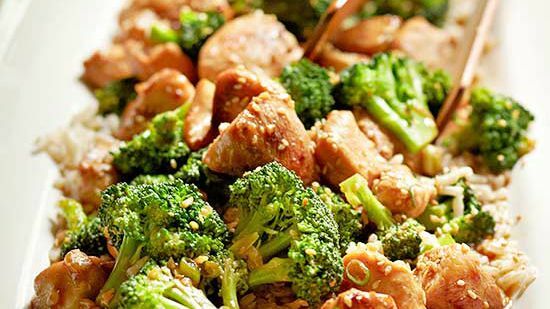 If desired, garnish with toasted sesame seed and serve with additional hoisin sauce. Makes 4 servings. 378 calories, (3 g saturated fat, 49 mg cholesterol, 877 mg sodium, 31 g carbohydrates, 6 g fiber, 29 g protein. The first time a made this stir fry, I followed the directions exactly. This time I added onions and red peppers and it was very good. I also substituted beef instead of chicken. Very good!! I rated you a one star because of how many clicks I had to make to get to this recipe. What should have been one click to one screen turned into four or five clicks and three different screens. Have to agree with one of the other commenters, could tell this recipe was going to be bland so I added onion to the vegetables, salt and pepper to the chicken, and garlic to the sauce. Turned out great with these simple additions.